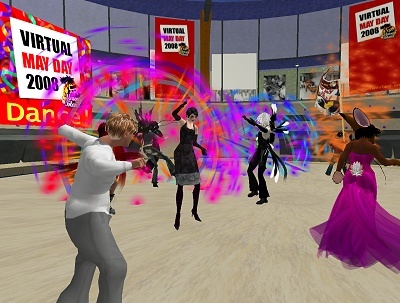 A bit late sorry, but here’s my report on our May Day celebrations in Second Life last week. Please do comment and let us know how it was for you too! All in all it was a great day, and pretty busy! Our counter prim recorded over 150 avatars calling by the island, with many making several visits to different sessions, but what I think was even better was the range of countries that people came from. Amongst those I met were RL natives of Belgium, Brazil, France, Germany, India, Italy, Mongolia, Norway, Russia, South Africa, Spain, Switzerland, the UK and USA, and there must have been unionists even more countries present that I didn’t talk to – leave us a comment if I missed you out! The international flavour of the event made things really inspiring, as people who could never normally meet each other face to face, and there was no shortage of topics people wanted to discuss. One such discussion in the bar resulted in the decision to agree a statement from everyone attending about the situation for our colleagues in Zimbabwe. This practical solidarity action was quickly co-ordinated with colleagues from South African and France, and put to a vote using SL’s proposal tools. Thanks to everyone for their help, support and comments on this – it’s clear this really resonated with people there on the day, and you can read the final statement agreed here. It was also great to meet our colleagues from Mongolia, as so few of us ever have contact with this country, and it was great to hear about how unions are helping workers there to get networked and reach out around the country and beyond. 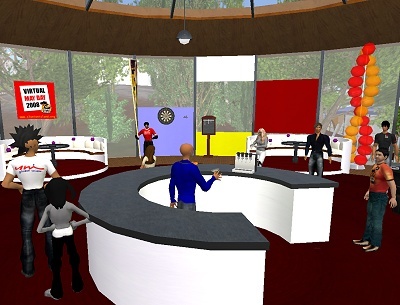 Other sessions involved introductions to Union Island for French and Italian speaking users. 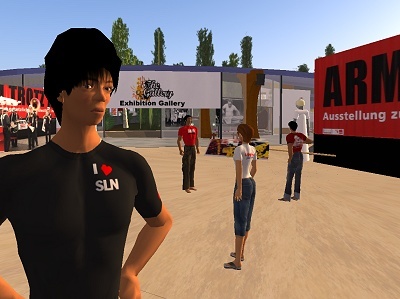 Around a third of residents attending were under 3 months old – with more than a few freshly rezzed – so introductory sessions like this, and a crash course (rather literally, given the debris covering the sandbox at the end) in SL building went down pretty well. No doubt we’ll be running this kind of thing again as more people join the community. 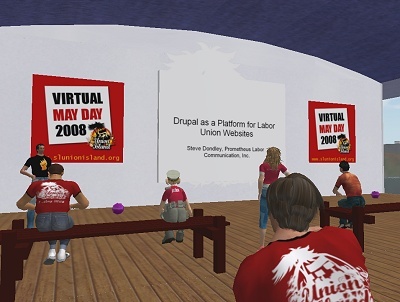 We also tried more specialist surgeries with Prometheus Hawker on building union web sites with the open source system Drupal, and with Hus Bing, Carlo Bernini and Engels Kas of the TUC Organising Team. We need to really grow the community I think before these become truly successful I think, but I was surprised by the number of people who came especially for Prometheus’ session, and seemed very excited about what they’d learned. 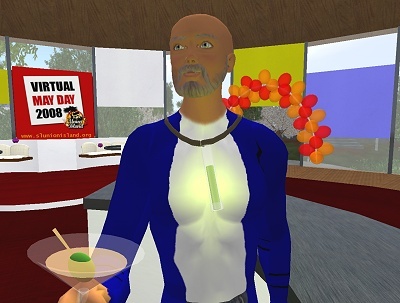 I sadly missed Forelle Broek’s session, presented with Second Life Left Unity, on the history and meaning of May Day, and only managed to log in as it was ending. There were a good number of people there though, and a very positive mood still in evidence. I managed to read Forelle’s presentation later, which has been published on the SLLU site. Go read it if you don’t know how May Day started. Actually go read it anyway – it’s a very good lesson! So I reckon all in all we had a great start to the project, and it’s made me very excited to see what we might be able to do with this next. Running the different sessions has given us some good pointers as to the type of events that people might want more of, as well as practical help with areas of Island management to make future events run more smoothly, like timezones and signposting. Hope to see you all back on the Island soon! Awesome opening event. Congrats on the new sim!